Customer's Reviews Emeralds & Jewelry Corp. Customer's Reviews Emeralds &amp; Jewelry Corp. I received the three items promptly yesterday. I am very pleased. I am so grateful for your assistance in selecting these pieces. They all complement my necklace beautifully. Each piece has been crafted with excellence. Each one is sleek, sophisticated, and elegant. 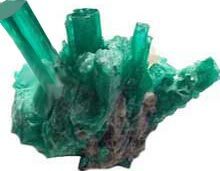 The emeralds are spectacular. Under the light they are brilliant and remind me of looking into a deep pool of clear, green/ blue water. The computer screen cannot capture this illusion. One must truly be fortunate enough to own to see one of your emerald jewelry pieces to experience this visual delight. I love how the diamonds set in the ring, bracelet and earrings almost appear to light up and enhance the emeralds which are the centre stage of each piece. Thank you again for helping me select these jewelry pieces, which I feel are pieces of art that I will treasure my whole lifetime. The emerald earrings and pendant arrived on Tuesday and they look terrific. I gave them to my wife yesterday for our anniversary and she was very excited by how beautiful they looked. I love the earrings because it complements the necklace both in color and shape. Seems like earrings and necklace were bought together in set. Thank you for making my day, I feel lucky to have the perfectly matched gemstone set which is very difficult to get in emeralds. Your husband did a magnificent job designing this ring with the little hearts around the basket.......thus /emerald is so beautiful that I am holding my hand out to look at it alll the time. Mireya, The emerald ring exceeded my high expectations! It is difficult to know the exact green color of an emerald on the internet, but the actual stone was better than it's internet picture! Add to that, the side diamonds were cleaner and brighter than expected. Finally, the craftsmanship of the ring equal or exceeds what is available at most local jewelry stores-my personal compliments to Norberto. It's a pleasure doing business with both you and Norberto. Best wishes for your continuing success! Date: Sept 09/2015 at 11:28 AMOntario CA. I just received the necklace and I can,t tell you how much I love it. The green emerald is gorgeous. The diamonds sparkle like flashes of white light. Its design is supreme elegance, simple and classic. This is a forever piece I will wear and pass on to my daughter in the future. Thank you for all your kind and excellent service. Fedex was prompt and on time. Hi, I've received the emeralds, and I like them very much, would you please help me to find a emerald for necklace, about 5ct, deep green? Date: Jun 11, 2015 at 3:00 PM Dunfermline UK. We've now given the necklace to my mother and she is absolutely delighted with it. It looks amazing! Thank you so much for making the whole process so simple and straightforward from start to finish. The ring is gorgeous, just like the picture. If you had not shown it on the hand, I would not have bought it. I've been so disappointed in the past with emerald rings that don't look like the picture. Seeing it on the hand makes all the difference. Good morning, just to advice that the ring was received this morning and it is totally stunning and a perfect fit. Both Pam and I are perfectly happy with our purchase and would like to take this opportunity to thank you for your communications and help with this purchase. Once again thank you for all of your help we will certainly recommend your company to any of our friends and acquaintances. Mireya; Lovely, just gorgeous pendant. Our 35th wedding anniversary will sparkle brilliant green & dazzling white, lucky us. BTW great service. Mireya, I am delighted with my beautiful new emerald ring! Thank you for sending it via expedited delivery. I am really enjoying wearing the lovely, high-quality emeralds I have purchased from you. So glad I found your website. We would like to request the free appraisal that is offered on all items purchased over $2,500.00. It has been a pleasure doing business with Emeralds & Jewelry Corp. The ring was more beautiful than described. We will defiantly recommend your web site to all our friends and family for their Emerald purchases. It is so nice to see there is still integrity and value to be found on the Internet. We will defiantly return for matching items to go with this ring. My wife loves the ring so we will be keeping it. Sincerely,............ Terry U. My gorgeous new emerald ring was just delivered, and it is stunning, even more beautiful than the pictures. I really appreciate your prompt service. Thank you also for the attractive and decorative Indian emerald queen paperweight/pen holder. I am so glad that I found your website with such high-quality products and much more reasonable prices than a retail jeweler would charge. Although emerald is not my birthstone (I was born in February), I am fascinated by their unique beauty and individuality. I actually prefer emeralds to diamonds. I Have received my ring today, thank you so much! I have been looking for a Colombian emerald engagement ring for years and could not find one I liked in the uk for a half decent price. The colour and clarity of the emerald is stunning. The perfect emerald green with very few inclusions! Thank you again! Hi Mireya- we received the ring yesterday and are thrilled with it! 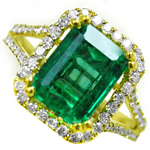 The emerald is beautiful, and the ring itself has wonderful craftsmanship. The pictures on the website didn't do it full justice! We showed the ring to a jeweler friend of ours, and he said it was well worth what we paid for it. He also commented on what a nice stone it was. Please feel free to post this on your website for anyone who may be on the fence about ordering. Some may be hesitant to order on line without being sure about the quality and authenticity of the item; but we can attest that our ring easily surpassed our expectations, and will happily buy again in the future.